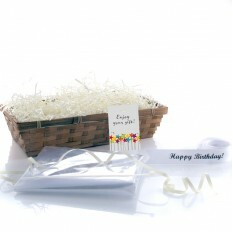 If you're searching for ideas to be able to create your own gift basket with items you have purchased elsewhere then we have just the thing for you! 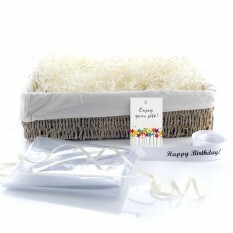 Our wicker basket kits are great value and allow you to come up with your own ideas to suit your own budget. Not to be confused with our bespoke hamper facility, these wicker basket kits will be delivered as components for you to add your own items at home. If you're the creative kind who likes to come up with thoughtful handmade type gifts for friends and family you might be searching for a wicker basket kit. These are perfect if you want to regift items you have at home or if you're trying to stick to a fixed budget. 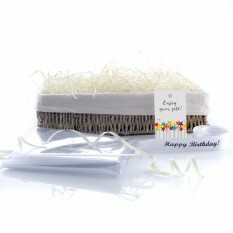 They are also brilliant to have stored away in the cupboard in case you may have forgotten someone's birthday and you'll be able to throw the perfect gift together with items you may already have or can quickly buy from the supermarket. 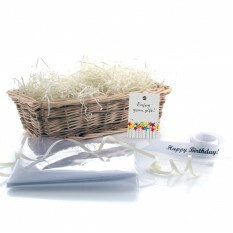 Each kit will have enough decorative shred to fill the basket and keep your gift items secure, the right size cellophane bag, printed ribbon and a gift tag for you to write your personal message on. 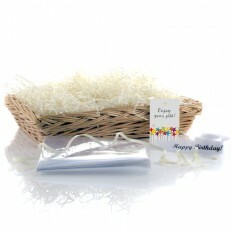 For an extra special touch, you can select a theme for your printed ribbon to suit the occasion.